On one occasion, when returning to his hometown, Ahmad Fuadi conveyed an intention to write his first novel, Negeri 5 Menara, the his beloved mother. She responded by handing a neat stack of paper to her son. Who would have thought, the very stack was a collection of Fuadi’s letters during his 4 years of studying at a pesantren (Islamic boarding school), that were kept by his mother until now. Fuadi instantly got a stronger trust in the great power of writing that enables a person to tell his or her life story despite long-standing. 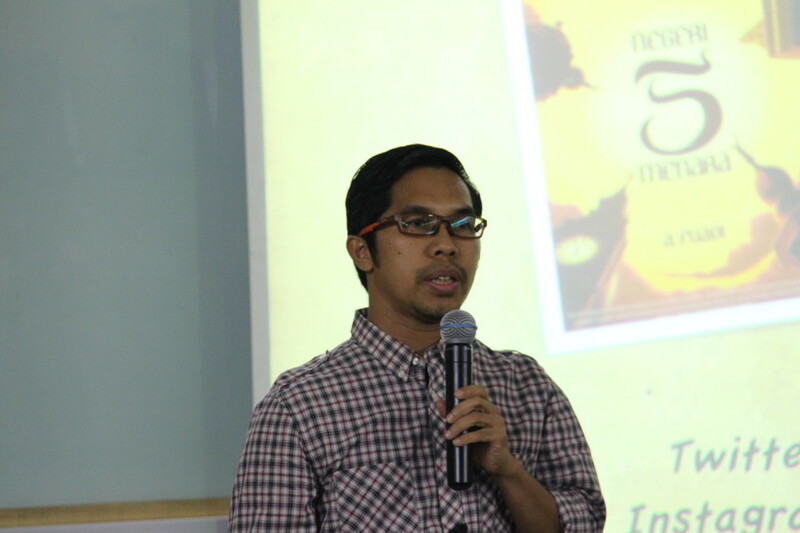 “A written work never dies, it lives forever,” said Fuadi before a group of students, book and written-work activists, including the public that gathered at Joseph Wibowo Center campus auditorium, to attend “Media Tech Talk”, a regular event initiated by the BINUS INTERNATIONAL’s Communication Programme. With that belief, Fuadi successfully completed his first novel which later was known as one of bestselling novels, written by one of this nation’s children. Not only enjoyed by Indonesian readers, this novel has earned a special place in the hearts’ of readers in more than 20 in 5 continents. In fact, the novel is a compulsory literature in several overseas schools, such as Singapore’s Xinmin Secondary School, New South Wales’ LOTE secondary schools, and the United States’ University of California. Fuadi has been invited for a number of times to a number of places, from overseas campus to government agencies to speak about his life journey. “Books took me further and took me to travel a lot. Meet a lot of people and touch people’s hearts around the world,” said Fuadi that time. Fuadi may have not expected that what he gets today is more than he could dreamt before. He admitted that as a child, he came from a very humble family who lived in the lakeside of Maninjau, West Sumatra. In that beautiful place, Fuadi was born from parents who worked as teachers. Fuadi had made himself familiar with the world of reading and writing at an early age. As a toddler, he acquainted himself with a pile of books in a reading room at his house. The 3 × 3 metre room was made by his grandfather and Fuadi frequently spent his time there the whole day, this habit continued until he grew up. “Books really are the window to the world, just as my grandfather told me,” said Fuadi. Rows of sentence he often read had stimulated a will to produce the same thing. Following his high reading desire, a strong desire to write began to grow. The limitations he felt during his childhood also encouraged him to write. “I grew up in a very modest family and it was not a sophisticated time as today is. Nothing can be a document of everyday’s life as good as writing. That’s when I felt that writing lives forever,” stated Fuadi. Not just to write, Fuadi also have had the desire to produce works that benefit others since long. Knowing that his first novel, Negeri 5 Menara, received tremendous response as one of the bestselling works, Fuadi was at once reminded to his mother’s words, “The best person is the one that benefits others. Since I usually write, then my motivation is simple, to be useful for others through writing,” said Fuadi. To be able to produce good writing, Fuadi admitted that he is not a writer with a long time talent. He thinks that it his his intention to write that has enabled him to produce written works that many people love. That strong intention must be built since the beginning of writing. “Writing is a long journey and spends a lot of energy. With a clear and good intention, the author will continue to gain energy for that,” Fuadi said. Beside intention, Fuadi also suggested that the process of writing should provide happiness and inner satisfaction. Write with happiness and inner satisfaction, then the desire to produce works that are liked and at the same time, touch the readers’ hearts, will be easier to follow. “If we write with distaste, then readers will dislike the work,” added Fuadi. Only after fulfilling those factors, then, as Fuadi suggested, can the authors go further into the technical realm of writing. To begin, Fuadi advised to find a “strong story” before all else to be able to touch the readers’ hearts. 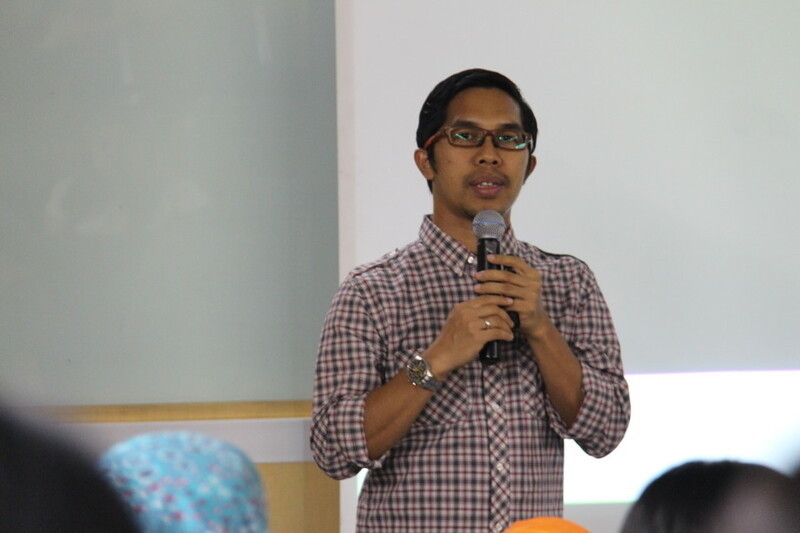 To build a strong story, Fuadi suggested four factors that underlie a work. “They are struggle/conflict, characters, journey, and writing from your heart,” he mentioned. The next step is making a research for writing. For Fuadi, research is an essential process. Without it, a book would not have a strong soul. Lastly, he disclosed tips about writing a novel that is popular among wider readers. Lastly, Fuadi advised attending students to keep on writing whenever, so that they continue to hone their writing skill. “To write well, one should keep on writing and practising. That way, your writing ‘muscles’ can be continuously trained and grow more ‘powerful’,” he ended.